Each day thousands of people walk past this building that stands just a stones throw from the world famous Centre Pompidou in Paris. It’s a fairly unremarkable building, similar to many throughout the city. Or is it? Take a moment to do something almost nobody walking by this building ever does; look a little closer. Do you see anything? Examine the windows carefully, paying particular attention to those on the right. Now do you see it? The windows are, in fact, not windows at all. They’re merely scenes painted into alcoves on the wall in a style known as trompe l’oeil. It’s not uncommon to see these kind of fake scenes on buildings, but the beauty of this particular example of trompe l’oeil is that most people, including the hoards of tourists who swamp the area at all hours, are unaware of their existence. On their own the windows of this building on Rue Quincampoix, in the Beaubourg district of Paris, are interesting enough. But what could be the reason for the trompe l’oeil? Property in this part of Paris is incredibly expensive, so why would a building in such an expensive part of the city not have real windows, especially when the rest of the building does? I puzzled over that question for a few days until I found the answer which, I think, is actually pretty interesting. It turns out that behind those trompe l’oeil windows there is nothing, or at least nothing that you might guess. Similar to my earlier post about a fake office, the windows, and indeed the whole style of the building, are simply a facade. However, unlike ‘the fake office, this facade actually serves a practical purpose. It is, in fact, an underground road and railway ventilation shaft, a structure that on its own might otherwise be an ugly utilitarian eyesore. The area was extensively renovated in the 1970’s and at that time the ventilation shaft was constructed to blend in with the building it’s attached to. The artworks were originally done in 1975 by Fabio Rieti and have been refreshed a number of since their installation, most recently in 2015. They’re painted on wooden boards and placed into the window shaped alcoves that maximize the effect of the illusion. There are two other such ‘fake buildings’ in Paris hiding underground train ventilation shafts. 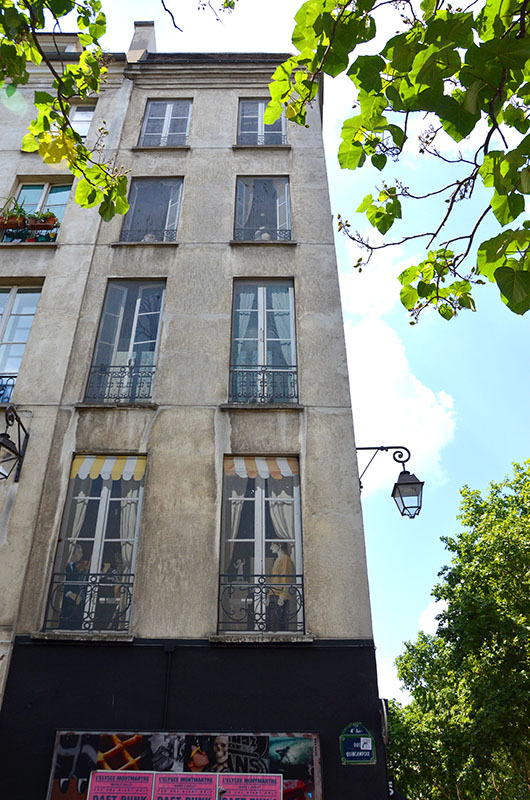 If you’re curious you can see them at 174 rue du Faubourg Saint-Denis and 145 rue La Fayette, however, neither of those buildings feature Trompe l’oeil or anything quite as interesting as this fake building at 29 Rue Quincampoix.